Students across the world are taking a vow of silence in honour of the Gay, Lesbian, and Straight Education Network’s “Day of Silence”, a student-powered initiative started at the University of Virginia in 1996 to raise awareness of anti-LGBT bullying, name-calling, and harassment. To participate, students vow to be silent for an entire school day to recognise the all-too-common silencing of LGBT youth that happens in schools across the globe on a daily basis. 150 students participated in the inaugural event in Virginia in 1996. The following year Maria Pulzetti and classmate Jessie Gilliam, who created the cause, strategized to bring the action to other schools across the country, thus launching the National Day of Silence. In 2000, a student campaign brought the Day of Silence to GLSEN who adopted it as part of their official program. The project has become the largest single student-led action towards creating safer schools for all, regardless of sexual orientation with over 8,000 middle schools, high schools, colleges and universities – across the USA alone – participating in 2008. Educational Institutions generally support the cause and respect students who wish to participate but there are legalities surrounding the “right not to speak” in a classroom setting. 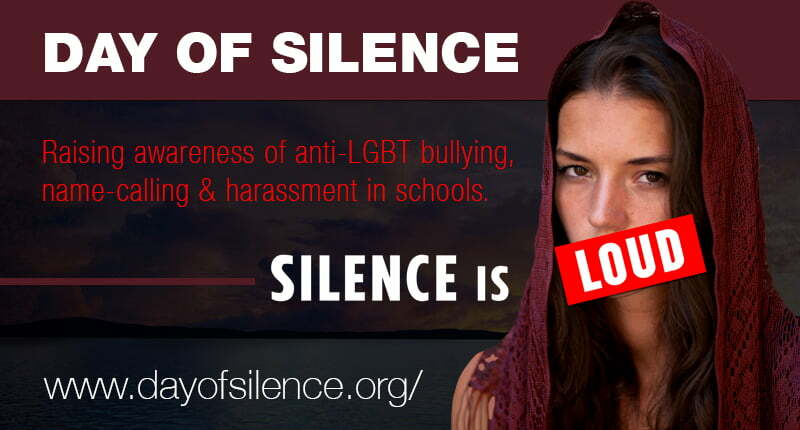 The Day of Silence website recommends that students consult with staff and teachers beforehand if they wish to remain silent during “instructional time” and the organisers advise students who are prompted to answer a question to do so. The goal of the Day of Silence is to make schools safer for all students, regardless of sexual orientation and gender identity/expression. There are other ways to get involved if staying silent isn’t your thing or keeping your lips zipped up is beyond your capabilities. Many students participate by staying clear of social media all day and keeping their profiles and accounts totally silent of posts for the day. In a Harris Interactive study of bullying in America, students said two of the top three reasons students are harassed in school include “actual or perceived sexual orientation” and “gender expression”. For this reason GLSEN encourages LGBT students and their allies to send a clear message to their classmates that LGBT bullying is unacceptable and a serious problem that needs to be addressed in schools worldwide. In addition, the study discovered that nearly 9 out of 10 American LGBT students reported having experienced harassment at school. Students across the country participate in GLSENs Day of Silence to bring attention to this problem, to let students who experience such bullying know that they are not alone and to ask schools to take action to address the problem. In the US, the Day of Silence has its opponents among the usual homophobic, religious and anti-LGBT groups. Some members of these organisations even go as far as to keep their children home from school on the Day of Silence to “protest” a movement seeking to keep schools safe and affirming for all students. In 2005, the Alliance Defense Fund began sponsoring a yearly counter-protest called the Day of Truth. Candi Cushman, an education analyst for Focus on the Family said she believes that “Events like these actually end up promoting homosexuality in public schools, and that actually creates a hostile climate for students of faith”. These organizations have officially endorsed GLSENs Days of Action.